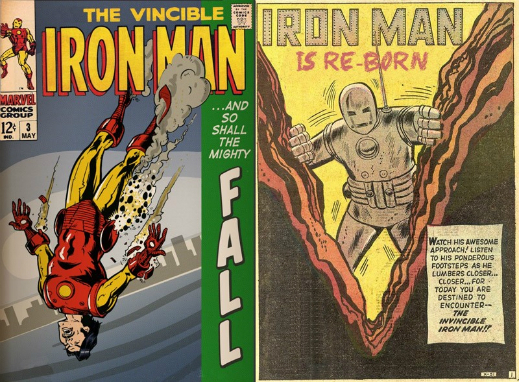 IRON MAN TAKES A TUMBLE – WILL AFRICA SUCCEED AUSTRALIA, BRAZIL, RUSSIA TOO, AS THE NEW LOW-COST GLOBAL SUPPLIER OF IRON-ORE? The Ukrainian civil war, and its aftermath, economic warfare between the US, the European Union, and Russia, are transforming the global flows of the minerals from which steel is made. Starting with iron-ore, the future for steelmaking will start at the minehead, not in Australia, nor Brazil, but in West Africa. That is if Gennady Bogolyubov, the Ukrainian miner, can help to produce high-grade iron-ore at a cash cost of $20 per tonne. At that price, Bogolyubov and China’s iron-ore traders and bankers calculate, they will be able to break free of the global price-fixing for the mineral which has been dominated, until now, by BHP Billiton and Rio Tinto in the US camp, and Vale of Brazil. Ending commodity price-fixing by just three corporations whose governments are tied to the US and the NATO alliance is also a strategic objective of Russia, which has sizeable reserves of iron-ore to export to Europe and to China. But for the Kremlin, and for its favoured iron-ore exporter, Alisher Usmanov, controlling shareholder of Metalloinvest, there is difficulty in reaching the $20 threshold – and finding Chinese investment financing to open new, big-volume, low-cost, high-grade mines. 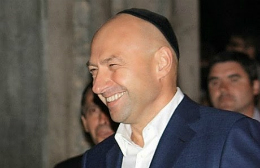 Bogolyubov has been identified in the pre-war Ukrainian rich-lists among the five wealthiest figures in the country. Unlike his peers – Rinat Akhmetov, Igor Kolomoisky, Victor Pinchuk , Konstantin Zhevago, and Dmitry Firtash – Bogolyubov has remained personally outside the conflict, concentrating his assets in manganese mining in Australia and Ghana, iron-ore in Australia. Frequently mistaken for his one-time partner Kolomoisky, Bogolyubov has been the target of UK High Court claims by Pinchuk, which can be followed here. Bogolyubov is responding independently of Kolomoisky. On September 3, Bogolyubov (right) announced that he is financing Sundance Resources with the option to convert into an 18% shareholding, priced at A$40 million (US$35 million). The Australian Stock Exchange (ASX)-listed company said that on approval by regulators and other shareholders, Bogolyubov would take a seat on the 8-seat board. 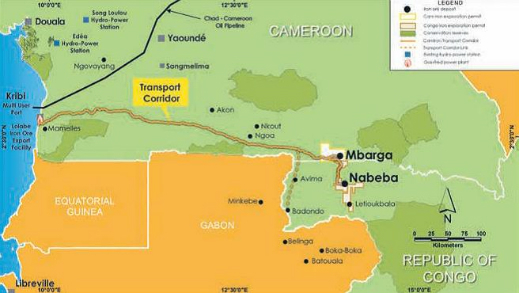 The proceeds would be spent, the company said, on preliminaries for the Mbalam-Nabeba iron-ore project in Cameroon and the Republic of Congo. The design for this African project calls for two mine sites, a rail line to the sea, and a new port. With a resource estimate of 4.5 billion tonnes, according to the feasibility studies, and estimated output of 35 million tonnes per annum, the project would challenge Vale’s Brazilian mines and Rio Tinto’s Australian ones, as among the world’s largest. Strategically, the Sundance project would be the largest independent source of iron-ore in the world, uncontrolled by either Vale, Rio Tinto, BHP, or Glencore, which is also starting an iron-ore mine at the Congo. For Bogolyubov’s strategy to succeed, a revolution in iron-ore pricing must convince the Chinese banks that the major producers can be knocked off their benchmarks, and the volatile spot-market pricing currently dominated by small, high-cost producers replaced by more direct Chinese control. Bogolyubov’s entry would make him the single largest investor in Sundance. He replaces the Sichuan Hanlong group, whose owner, Liu Han, attempted a $1.2 billion takeover of Sundance between 2011 and 2013. The Hanlong bid collapsed when Liu and his brother were arrested on corruption, murder, and other charges. In March of this year the brothers were convicted and sentenced to death.Their fate suspended negotiations for Chinese bank financing for the project. These negotiations now resume with Bogolyubov and the Noble Group, the Singapore–based trader, which signed an agreement with Sundance in March to ship and sell mine production. The financing requirement is estimated at $3.5 billion for the rail, port, power and other infrastructure costs, plus $1.1 billion for the mine itself. 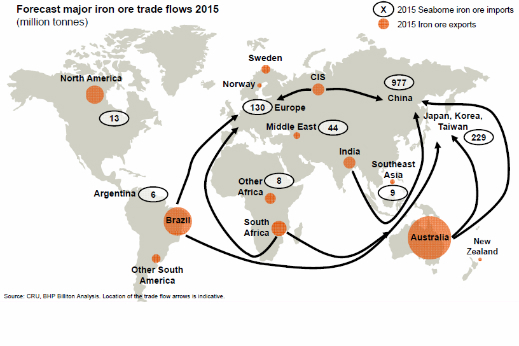 On the map of global iron-ore movements forecast for next year, Australia and Brazil dominate as the global sources of iron-ore; China is the dominant consumer. Russia’s significance as supplier to Europe in the west, China in the east, is relatively small on the map. West Africa is still a blank. Until now, Liberia and Guinea have been active targets of Russian mining investment – until the Russian oligarchs ran up larger debts to the state banks than they can afford to repay. Alexei Mordashov, the steel oligarch, has abandoned the Putu iron-ore project in Liberia, but cannot find a buyer. Oleg Deripaska is the dominant Russian in Guinea, but he can’t afford his obligations to open new bauxite mines and alumina refineries. Rio Tinto, Vale, and others dominate the future Guinean iron-ore fields, but they are in no hurry to invest as the price of iron-ore plummets at much the same speed as the re-election chances of the local despot, Guinean President Alpha Conde. For more on his Russian relationships, start here. Kremlin directives also put an end to the attempt by Victor Rashnikov’s Magnitogorsk Metallurgical Combine (MMK) to invest heavily in Australian iron-ore through Flinders Mines in 2013. The domestic alternative is MMK’s Prioskol project, in western Russia, with reserves of about 2 billion tonnes. The largest undeveloped Russian iron-ore project is Timir, in the fareastern Sakha republic, with 3.5 billion tonnes. It is still on the drawing-boards of a joint venture between state diamond miner Alrosa and Roman Abramovich’s Evraz. The oligarchs have proved unwilling to invest the multi-billion dollar sums over the long terms required to exploit Russia’s new iron-ore projects. They are not allowed by the Kremlin or the state banks to invest in iron-ore projects outside Russia. Instead, smaller volumes of Russian investment are going into higher-value iron products, such as pellets and briquettes, whose iron (Fe) mineralization is concentrated at a higher level than the ore at the minehead, with lesser impurities. That makes steel smelting more cost-efficient, with less pollution. So what are the costs of iron-ore supplies, and who can compete now? The latest report from Vale indicates that in the first quarter of 2014, the cash cost of its iron-ore production was $21.59 per tonne; the previous quarter cash cost was slightly lower at $20.84. Rio Tinto claims that at the end of 2013 its cash cost stood at $20.80. 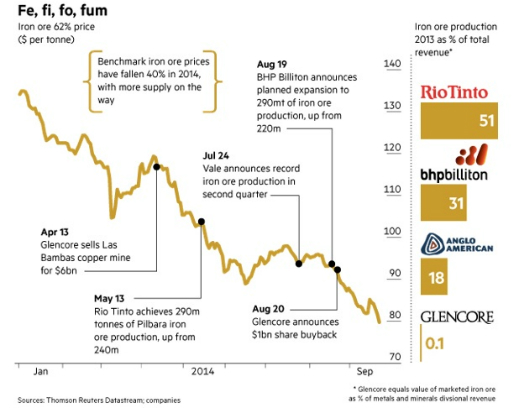 On other measures of cash cost, BHP Billiton is about $10 per tonne higher than Rio Tinto’s. It is difficult for Russian iron-ore producers to compete, although the falling rouble and shorter transportation distances help to compensate. Chinese financing in Russian iron-ore mines has so far been restricted to the small Hong Kong-listed, UK-owned producer, IRC. But at its current, unreported cash cost of production, IRC is loss-making. 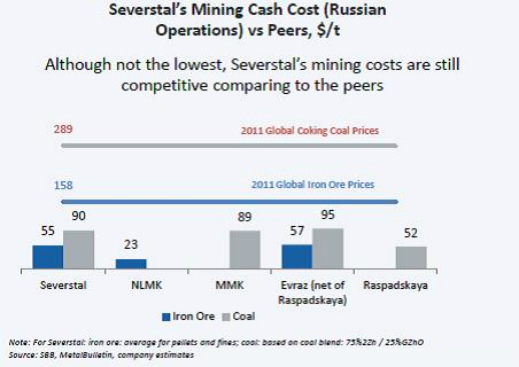 Severstal’s latest cash cost (concentrate) estimates for the first half of this year are $43 for its Karelsky Okatysh mine, and $42 for its Olkon mine. Metalloinvest, whose Mikhailovsky and Lebedinsky mines are the largest currently in operation in Russia with almost 15 billion tonnes of reserves, has published cash costs for pellets and hot-briquetted iron (HRI), but not for iron-ore: in 2013 Credit Suisse estimated that Metalloinvest’s cash cost at the minehead was around $30. This year, Metalloinvest told Moscow bank analysts that cash cost of iron-ore concentrate at the Lebedinsky mine is “around $30”; pellets, $40. The cash cost at Mikhailovsky is $5 to $7 more. That was before devaluation of the rouble began to lower the dollar estimates. Roman Kunilovsky, the spokesman for Metalloinvest, said this week in response to a question about Fe grade that the magnetite ore at the Mikhailovsky and Lebedinsky mines has “an average iron content of 34% to 39%.” Because of the differences in Fe grade or percentage, the cash cost numbers aren’t exactly comparable. For the steelmaker, the optimum grade of iron-ore is Direct Shipping Ore (DSO) – that means ore of more than 60% Fe content, rich enough to go more or less straight from minehead to smelter. The Australian ore is DSO; the Russian is not. Concentrating the ore into pellets or briquettes adds cost, reduces competitiveness. For transporting iron-ore to China, Russian rail costs erode the production cost advantage, and allow West African shipment, even over much longer seaborne distances, to become more competitive. That’s because he is calculating a minehead cost of $25, and shipping cost of less than $25 per tonne. In five years’ time, Sundance believes its cash cost and shipping costs will be the equal or less than the Australian and Brazilian sources.